Some political groups on the left are borrowing a tactic from disinformation campaigns, placing ads on Facebook that pretend to be impartial information or unbiased news sources, when in fact the ads spread misleading facts about candidates. 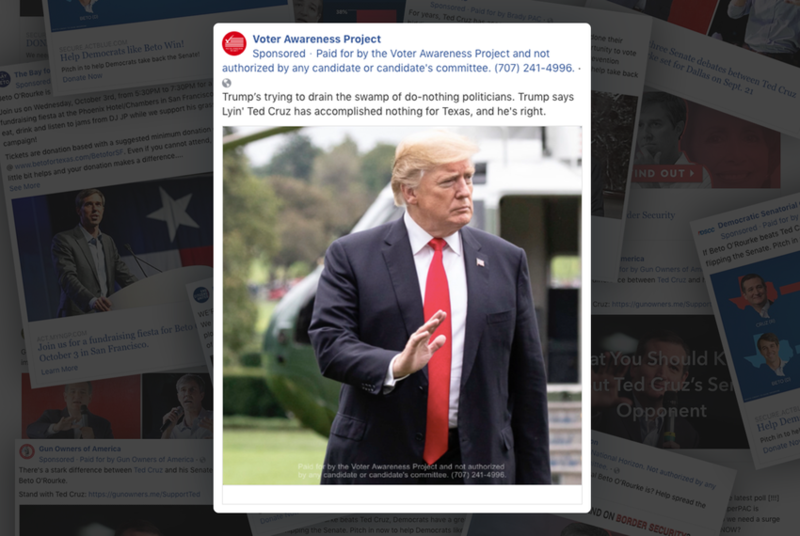 One ad, taken out by a group called “The Voter Awareness Project,” reopens old wounds between President Donald Trump and U.S. Sen. Ted Cruz, implying that Trump is at odds with Cruz even as the president stumped for the senator last week near the end of Cruz’s surprisingly close re-election bid against Democrat Beto O’Rourke. "Trump’s trying to drain the swamp of do-nothing politicians. Trump says Lyin' Ted Cruz has accomplished nothing for Texas, and he’s right,” the ad reads, referring to a 2016 tweet from when Trump was a candidate. But Trump and Cruz have since buried the hatchet. Trump has been endorsing Cruz for re-election since February. He recently said, “He’s not Lyin’ Ted anymore. He’s Beautiful Ted. I call him Texas Ted,” and he held a rally for Cruz last week in Houston. The name of the Oakland, Calif.-based group running the ads sounds nonpartisan — The Voter Awareness Project — but the super PAC behind the ads is not. According to filings with the Federal Election Commission, the super PAC’s treasurer is Markos Moulitsas, the well-known liberal blogger behind Daily Kos. Others who monitor political ads called the Cruz ad deceptive, however. Moulitsas denied that the ads were misleading and said, “The ads include the key context of the date the statement was made.” The date was included in portions of a 10-second video included in each ad. Moulitsas’ Voter Awareness Project has also run ads criticizing Ron DeSantis, the Republican nominee for Florida governor, that cites more recent criticism from Trump — “Trump calls DeSantis ‘disloyal’” — a remark from September. The only funding listed on VAP’s recent Federal Election Commission filing is $100,000 from Kos Media, of which Moulitsas is the founder. The Voter Awareness Project is by no means the only group with a vague name that masks its partisanship. In fact, several outside groups are using Facebook ads to push their views ahead of the contentious 2018 midterm elections. To be sure, outright false ads exist on Facebook, too, and the phenomenon of misleading or vague names for groups behind ads is not unique to Facebook. It’s not even a new idea. Hard-to-trace direct mail flyers that spread misinformation have been a feature of politics for decades. But the practice has flourished as part of Facebook’s cheap and easy-to-use advertising system. A campaign or outside group can set up many Facebook pages, each corresponding to a specific race or target demographics, and then put those pages’ messages in front of voters with ads. While these groups can sometimes hide behind a vague or misleading identity, Facebook has taken steps to address some egregious cases. As ProPublica reported in May, ads under the anodyne name “Ohio Primary Info” were shown to voting-age Ohioans. The advertiser, however, was not a source of objective information about the election. In fact, the ads were paid for by the campaign of Richard Cordray, now the Democratic nominee for governor. Other groups have pages that masquerade as news outlets: “Breaking News Texas” criticizes Republican congressman John Culberson of Houston in a mock newscast saying he “FAILED to prepare Texas for Hurricane Harvey.” A nearby disclaimer saying the ad was “paid for by EDF Action” makes it a bit clearer that Breaking News Texas is actually the Environmental Defense Action Fund. Culberson’s re-election bid against Democrat Lizzie Pannill Fletcher has emerged as one of the most expensive races in Texas this year. There are plenty of similar examples on Facebook. “Heartland Gazette,” “World News Reporter” and “Gulf State News” are not real news outlets, but they ran meme-like ads with text superimposed on images, advocating lower tariffs and an end to unfair bail practices, and praising an experiment that offered free birth control. All three are run by a now-dissolved company called New American Media Group LLC. All three pages have since been deactivated or deleted by Facebook, though at least one page, a parenting-themed one called “Raising Tomorrow” whose ads say they’re paid for by New American Media Group LLC, remains active. A request for comment via the lawyer listed on the company’s incorporation paperwork was not returned. Disclosure: The Environmental Defense Fund has been a financial supporter of The Texas Tribune, a nonprofit, nonpartisan news organization that is funded in part by donations from members, foundations and corporate sponsors. Financial supporters play no role in the Tribune's journalism. Find a complete list of them here.